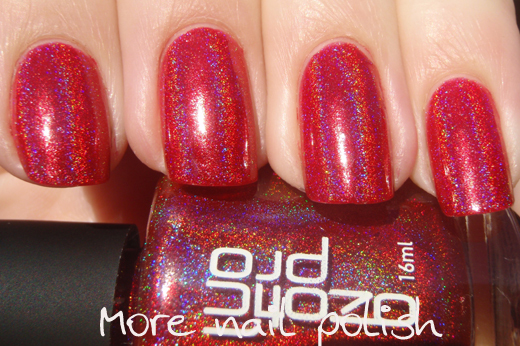 I had a request from the lovely Swååfie to show the Ozotic Pro red holographics. So today is 518 (the linear holo) and tomorrow will be 621 (the scattered holo). I love getting requests, it makes it so much easier to pick a colour to wear. Now I don't wear red polish very often. I find red polishes very unforgiving as far as application goes in that you have to be really neat, otherwise it is very hard to get it clean around the cuticles. But I have decided I'm going to commit myself to a red week and wear a different red polish every day! Ozotic 518, also known as Flame, is a slightly pink toned red linear holographic. This was three coats with a top coat of Seche Vite. Unlike the Ozotic scattered holos, these don't go dull or change with the top coat. 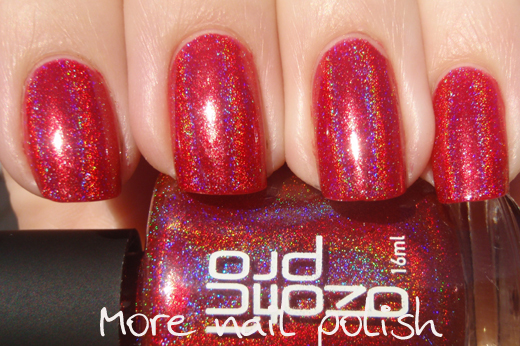 I believe that this polish is one of only a few known red linear holographic polishes that are readily available (as long as your prepared to drop the $$$ for it). I got this from piCture pOlish. 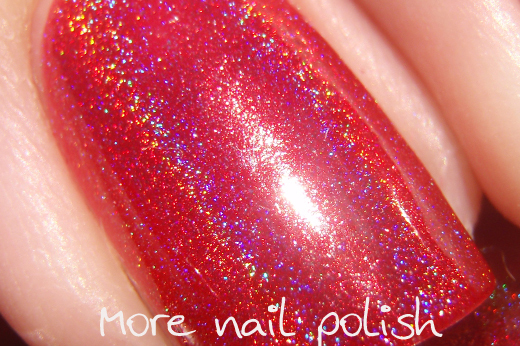 Red linear holographic - it really doesn't get more spectacular and in your face than this. I'm off now to pick my favourtie reds to wear and swatch this week. Happy Monday. Usually I'm not mad about red polishes but this one is just awesome. For me to say I'd wear it is definitely a turnaround. Thanks for showing it. I love it but I think Ill go for glitter gal red this time! Cant wait for red week! Love <3 So glad I got this one!! I can't wear red nail polish (can't or won't, same thing hey), so I only own one red creme. This, however, I think I will need to get my hands on. I love this! I've never seen a true red linear holo and now I will need to buy this one for sure!